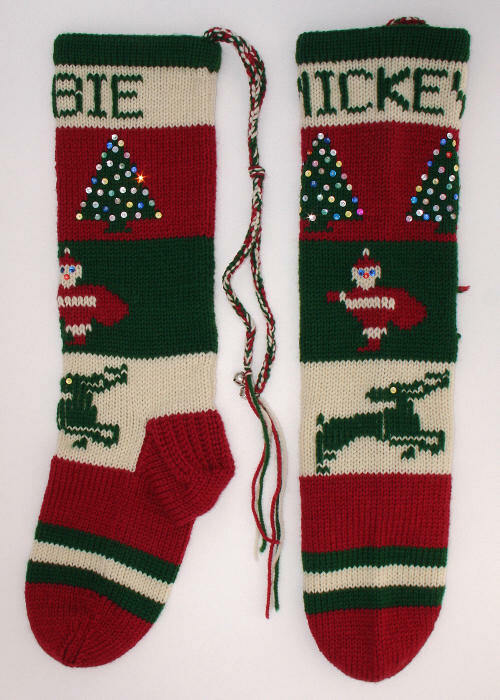 Here are examples of custom Christmas stockings that I've knit with reindeer pictures on them. Reindeer pictures can be handled in many different ways: head only, full body, standing, leaping. They can work well in either light or dark brown, depending on the background color. Some reindeer pictures are moderately realistic, but many are more stylized. Please look to see what Customers Say about stockings I've knit with reindeer pictures. This small reindeer is surprisingly realistic and detailed for its size. A tiny red nose adds a fun touch. This is an elegant leaping reindeer picture. The red Rudolph nose adds just a touch of whimsy. This reindeer is similar to the one on Albert's stocking, but it's a bit smaller. There is a large tree on the other side of this stocking. I really like the sweet, innocent appearance of this young Rudolph. The snowflakes add a nice extra dimension. Here's a different rendition of the Rudolph on the green background. The top edge is different, and there are added embellishments: snowflake sequins, round sequins on his eye and nose, a green yarn bow, and bells at his neck. Reminiscent of "primitive" or "folk" art, this stylized reindeer is very nice for small spaces. This cute reindeer has a red sequin nose and black sequin eye and mouth. His Santa hat is trimmed with angora on the edge and a white pompom on top . This was a remake of a stocking more than 50 years old. The reindeer picture is quite unusual. Its eye, and Santa's eye, are sewn-on sequins. The trees are decorated with multicolor sequins. 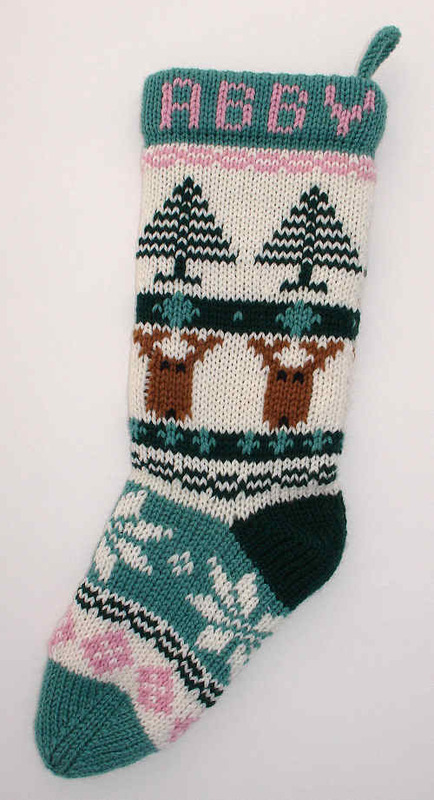 The same design in brighter colors, with the reindeer a classic brown. This sweet reindeer picture is from a pattern purchased by the customer. These colors, and the background arrangement, are the classic choices for this design. One family uses the same pattern, but with red accents for the girls and green accents for the boys. The same design, with a different layout of the background colors and the name. The pompom makes for a more mischievous look. Not very photogenic, but Rudolph is handsome in the Victorian-style colors. Burgundy replaces bright red and hunter green replaces bright green. The design was modified slightly to make it less feminine. This reindeer design is from a book purchased by my customer. It seems particularly suited for a man's stocking. The same design with a white background looks quite different. This is an unusual reindeer picture. The elongated body gives a clear impression that it is leaping or running. This reindeer picture is a stylized design of my own. 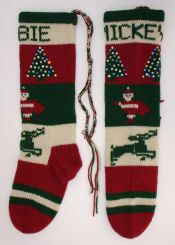 The colors of the stocking are a "feminized" version of the traditional Christmas colors. This reindeer is too wide for most stockings. Many use reindeer pictures that are faces only, or show the reindeer leaping. 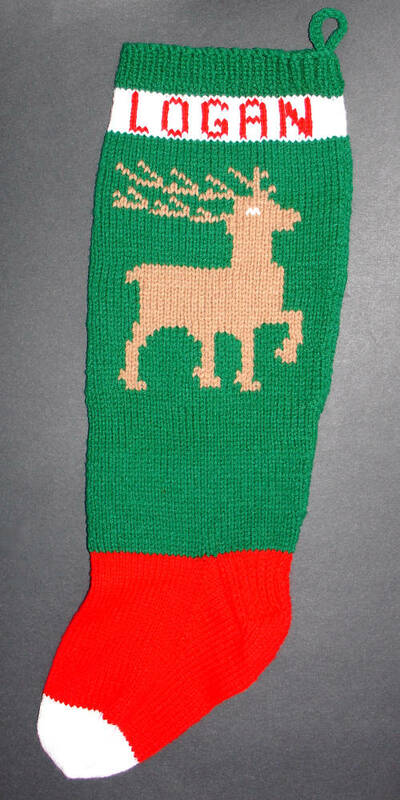 A leaping reindeer is more vertical and thus easier to fit onto a typical stocking. Angora yarn gives this reindeer a fluffy texture. Silver charm snowflakes sparkle in the sky. See Santa Claus Pictures for a look at Santa in his sleigh . A reindeer peers over Santa's shoulder while Santa is checking his list twice. This design wraps all the way around the stocking. A back view shows the rest of the reindeer's head, as well as Santa's book on the other side. It almost looks as though Santa doesn't want the reindeer to see the list! If you're interested in a stocking with reindeer pictures, you can find out more about ordering custom Christmas stockings.